Mr. Anderson is the Founding Member of Anderson Crawley & Burke, pllc headquartered in the Jackson, Mississippi area. Born in Hazard, Kentucky, he is a member of the American Bar Association, Mississippi Bar Association (Workers Compensation Committee, Alternate Dispute Resolution Committee), and Defense Research Institute (DRI). 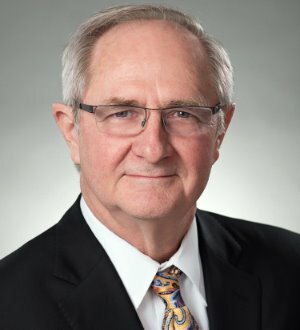 He has served as Chairman of the Workers' Compensation Section of The Mississippi Bar and has been active throughout his career in pursuing system reforms and improvements. Mr. Anderson has been a faculty member for numerous seminars relating to workers' compensation and other employment related issues, and he offers a series of STAR® training seminars to the workers' compensation community regarding the Mississippi Workers' Compensation Law. In addition to being in private law practice focused primarily on workers' compensation issues, he served as General Counsel for Mississippi's largest workers' compensation insurance organization, and early in his career was with the Mississippi Workers' Compensation Commission, opportunities which have given him an added perspective in dealing with the myriad of issues surrounding the workers' compensation community. Mr. Anderson serves on the Board of Directors of and is a Past President of the Mississippi Workers' Compensation Educational Association, Inc. (MWCEA). He has been Chairman of the MWCEA's annual educational conference since 2008. He is also Editor of the MWCEA's Workers' Compensation Claims Guide, a publication providing a summary of Mississippi workers' compensation law for claims professionals, employers, and other professionals interested in learning about the law. He is also a speaker for and an active member of the Multi-State Steering Committee which is a part of the Workers' Compensation Institute (WCI) annual conference in Orlando. He is co-chair of the National Workers' Compensation Review, a cutting edge program offered as part of WCI's annual conference. He is a Fellow in the College of Workers' Compensation Lawyers and serves on the Board of Governors for that organization. Mr. Anderson also serves on the National Board of Directors for the Multiple Sclerosis Association of America (MSAA) headquartered in Cherry Hill, New Jersey, and in 2015, was elected to serve a two year term as Chairman of the Board of Directors for MSAA. A graduate of the University of Southern Mississippi and Mississippi College School of Law, Mr. Anderson's current focus in law practice is in the areas of workers' compensation litigation, insurance/self-insurance regulation, and mediation. Mr. Anderson is admitted to practice before all courts in the State of Mississippi and before the United States Supreme Court. Mr. Anderson has carried Martindale Hubbell's highest rating (AV) since 1990 and he has been listed in The Best Lawyers in America since 1995. He was named Lawyer of the Year for 2012 by Best Lawyers in the field of Workers' Compensation - Employers in the Jackson, Mississippi area. He is also listed as a Super Lawyer in the Mid-South and was listed by The Mississippi Business Journal as a Leaders in Law. In 2012, he was named Lawyer of the Year by the Mississippi College School of Law.